French onion soup is a classic member of the French cuisine family, but its optimal cheese topping is a topic of intense debate. There is no question as to if there should be cheese or not, but rather what cheese there should be. Some would argue that Gruyère is the most preferable cheese to use, but the truth of the matter is that there are plenty of superior alternatives. In particular, Comté stands above the rest as the superior French onion soup cheese. Why is this? In this brief piece on cheeses, we will analyze the pros and cons of each to decide which candidate is most belonging on the classic French dish. Let’s start with some characteristics of each. Gruyère is described as having a “compact” texture with a fat content of ~43%. It is a hard-class cheese. This means that it’s thick and something like a brick of solid bacteria and expired milk, which is pretty good as far as cheese is concerned. It also has a “fruity”, “nutty”, and “earthy” flavor profile. However, Comté possesses similar and arguably superior qualities. With a “firm” and “grainy” texture, Comté offers the mouth more to explore, like a deeply panicked insect which has found its way into the living room of a disorganized plastic model enthusiast. (Rest in peace, Harold; you will be missed.) In addition, its semi-hard nature make it more accessible to the general public. If you’re physically unable to grate a hard cheese, then just break it over your soup with your hands. It’s so easy! Plus, if your soup grows slightly colder than when it was fresh, Comté will retain its elasticity for longer, probably. Finally, its average fat content of 45% and “smokey” taste in addition to “fruity”, “nutty”, and “earthy” make it a stronger, richer cheese. Basically, Comté is the thinking man’s cheese, offering more to taste and a more vibrant mouthfeel compared to Gruyère. There’s also the question of bloodline. The one with the true right to a nation’s throne is the one which has blood ties to its people. French onion soup is (obviously) a French dish. It was born and raised in France and that is where it shall meet its inevitable demise at the hands of the Spaniards. Now, consider Gruyère. It is not French. In fact, it is an impostor sent to us by the Swiss! 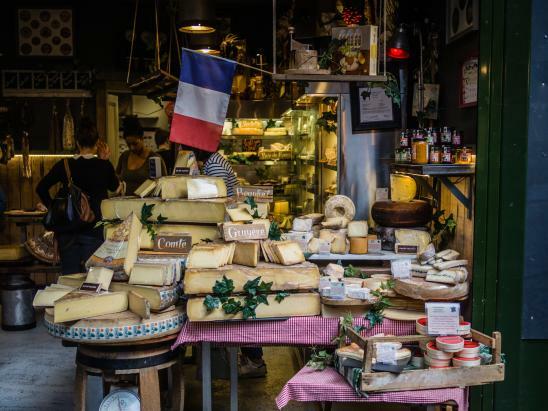 Indeed, it is an act of international espionage to infest the world of French cuisine—filled with its duck gizzards and gastropod obsessions—with this shabby cheese from a tiny country that is only known for its spinelessness on the global stage. Think of the children! How do you think this is affecting them? They are not raised on true, pure French cuisine and as such will grow up ignorant to the truths of the western European cooking scene. In fact, France’s entire economy would be improved through ousting this impostor and replacing it with the true crown prince of French onion soup, Comté. Pure, blonde French aura emanates from every morsel of its crumbly majesty. Eradicating the unclean Gruyère menace would solve every single problem in France ever, instantly. All of the money used to purchase this Swiss menace is drained from the pockets of France’s hardworking and used to feed the mouths of the Swiss bourgeois, whose pockets are lined with Nazi gold! In fact, the French GDP would increase by 900% by accepting the master cheese, Comté, in all of its French glory. Make no mistake, the obvious solution to the Gruyère problem is complete and total destruction. We must seek out every last traitorous wheel of Gruyère and see to its removal from French soil. Hear me and take to the streets! Raze buildings, throw Gruyère wheels off bridges. Stop at nothing to see that we completely and utterly cleanse this land. Anyone who refuses to comply and harbor Gruyère in his home shall have the rest of his cheeses eradicated along with it. It is our duty as a people to, through any means necessary, protect France from her Gruyère ravagers! This is how we shall instigate our revolution to completely and wholly reclaim France for the French, starting with the cheese on our soups! In conclusion, while Gruyère and Comté share similarities in certain characteristics, such as color and aroma, Comté is a more deeply developed cheese. It harbors a wider range of flavors within its paste, boasts a generally higher fat content for increased richness in taste, and offers slightly a softer texture. In addition, its French origin suits its usage in French soups. With that being said, please consider using Comté in your next French onion soup to add greater depth to your soup consumption experience. Consistency is mankind’s mark upon the world. Nature is an unpredictable mistress, often succumbing to the radical winds of change. However, man and his two hands have bridled nature, making consistent the inconsistent, taming the untamed, and curdling the uncurdled. The creation of the French onion soup marked a turning point in the history of man; so momentous an occasion that it birthed such famous proverbs such as “It’s the best thing since French onion soup” and “It’s as easy as French onion soup”. The day of its inception meant that mankind and society had finally reached a level of refinement and civilization that mere generations earlier would not have thought possible. Of course, under the modern bliss that was bestowed upon us with the creation of French onion soup, it might seem absurd to claim that we were without civilization before its invention. I must concede that this is true, for we did not only lack civilization but also loathed it. We were backwards, ruffians, barbarians without morals. What is French onion soup if it is not a map of civilization? Should we apply a Marxist critical lens, we should see that the melted cheese on top is naught but the cooperation of the bourgeois, and below in the darkness lies the caramelized onions, trapped and unable to reap the profits of their labor. If we apply a racial overtone, we can see the unfortunate history of the pure white cheese lounging at the top, while the darker crouton below is robbed of any rights by the cheese. French onion soup has even given us the scientific method, with the unorganized mass of broth below that, when examined and analyzed, allows us to reach the beautiful integration of all scientific facts in the melted cheese. Therefore, any change to French onion soup would be a move towards the destruction of society. Mankind has taken the lawless and wild raw ingredients that nature has given to us and has refined them, making them into the four constants of French onion soup: the rich beef broth, the firm crouton, the succulent caramelized onions, and the smooth layer of Gruyère cheese. Gruyère cheese is the key constant, as it holds all the rest of the soup– and society– together. To modify the cheese in the slightest is the greatest affront to all the efforts of mankind to produce soup and civilization. Yet the great hosts of error have come to field to debate such facts, to tear down the unequivocal notion that the necessary ingredient is not simply any cheese, but the proud and noble Gruyère cheese. Other cheeses have been recommended as a replacement, such as Comté. However, there are 83 flavors of Comté cheese. There can not be 83 variations of a cheese that is symbolic of society’s unity. Are there also to be 83 different moral compasses; some saying not to kill, and some saying to slaughter everything, and some in between? Other cheeses, especially Comté, would result in none other than the complete collapse of society into bloody anarchy and a consequent collapse of all morals. However, there is only one Gruyère cheese, making it a proud symbol and model of the unity of society. There would be no conflicts between flavors because there is only one flavor, and a smooth one at that. Furthermore, Comté cheese has been rated as one of the world’s “finest cheeses”. A “fine” and elitist cheese is not a cheese to represent society. We do not champion fierce and haughty elitism that represents only the few. Gruyère is a cheese that represents the average member of society, as it is a cheese of humble origins with a rough rind to show the dedicated and industrious nature of everyday people, while having a creamy and gentle inside to show the humility and virtue of all the members of society. In short, if we condone or permit the application of Comté cheese to French onion soup then we render all the morals of society moribund. Gruyère cheese is the perfect binding element and model for societal perfection because of its very nature. If we are to change such a cornerstone of civilization like the cheese of our beloved and glorious French onion soup, then we might as well surrender ourselves to barbarism now in order to prepare to the subsequent collapse of all things civilized and holy.